It’s been a while since my last review, but I had been busy lately. So, I am going to take you back to the past, specifically in 1987. It was first released on arcade and it was a smashing success especially with the multiplayer mode. It was so good that eventually after 1 year it was released on the Nintendo Entertainment System. It received perfect scores from magazines and it was the best experience, the game itself was so hard that everyone, EVERYONE until now remembers the 30 life code. The game then released in all kind of computers and some clones consoles, commodore 64, PC MS-DOS, Poly/Fun Station and I think Amstrad too, and in 2006 it proudly conquered a place in Xbox arcade classics. So enough with the history, what about the game? Firstly, there is no plot whatsoever in the game, you just start in the jungle shooting bad guys, bad robots, bad aliens etc, which is actually not a problem. The genre is errr, sidescrolling-action-platformer-shooter, or just simply Run and Gun. About the game play, what can I say, a jump b shoot, that’s it a simple game equals a great game. The game has a variety of bosses, enemies and environments; there are also a variety of weapons. The F letter is the flamethrower slow weapon but powerful enough, the L is the deadly laser, probably the most powerful weapon but its hard to aim with it, the M is the machinegun, a balanced weapon and the S is the shotgun my personal favorite, and a little overpowered, you can shoot in the whole screen. You also has 2 power ups, the B which I supposed is stand for Barrier it makes you invincible, and the R (I have no idea) makes you shoot faster. 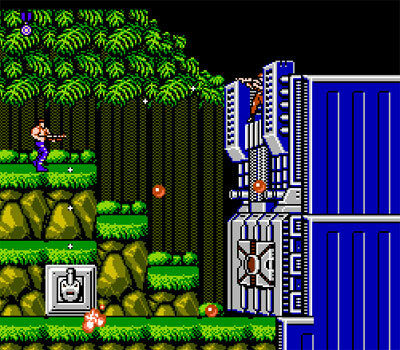 The levels, you start in a jungle, the first level is easy and you can collect a good weapon for the next stages. After that you will encounter a slightly different view called “behind the player”, there are only 2 levels they are both easy if you learn the patent. The boss is a giant ball, easy. Now the waterfall, this level wouldn’t be hard, but there is a tiny little thing that makes things hard. This level is an upscrolling, and while you go up, the level disappears so if you accidently fall a step or two down, and the platform is disappeared, you screwed. After that there is the second behind the player mode, and then you fight 2 ball-like things. And now the hard levels, the snow level (I always hate the snow level, but not as much as the sewer level in games) this level is hard, cause everyone has weapons, and I mean real weapons, there are grenades falling from the forest, and a lot of stuff going on. After that you fight possessed-voltron. Then there is the factory level, the one that makes the game platformer, and then another factory level with more pitfalls and hazards to pass. And then suddenly the alien level, the small one. And then the final boss the mother brain? Why this game is hard? Lets see, you start with 3lifes, and 5 continues (correct me if I am wrong), every 50.000 score (I miss score in modern games) you get an extra life, and every time you finishes a level you get an extra life too. With all that, the game sounds easy, but its not, after the waterfall level, things are hard, but I think the whole game is all about trial and error, Konami added the cheat code, the famous 30 life cheat code it was not a game genie or anything for that reason I guess. The graphics for this game was different for each console; I think the ms-dos had the best, but anyway the nes version was very colorful with a unique beauty that still impresses me. This game is definitely a classic, it has a great soundtrack, from the moment you press the start button, you enjoy every single second of this game, only the last level has ****ty music, but it’s forgivable. The game feels small after playing it and finishing it, multiplayer is actually fun and it’s the only way to fully enjoy this game. It was one of the best games and my NES favorite, for the young users or for the users who haven’t played this game, I recommend it even now, don’t buy anything, just use an emulator or your xbox.